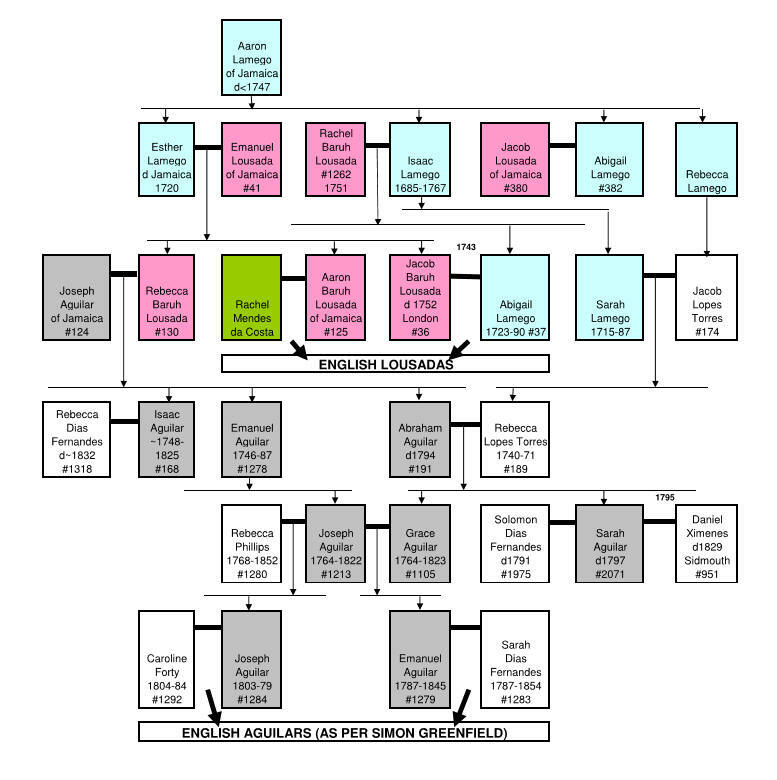 The chart of the English Lousadas and Aguilars shows they happened to descend from Aaron Lamego of Jamaica. Details of the Aguilar genealogy were provided by Simon Greenfield who descends from the Joseph Aguilar and Rebecca Baruh Lousada marriage via Joseph Aguilar #1284. Mike Dugdale descends from Emanuel #1279 (for descendants see the PDF 'AguilarEmanuel18090530FernandesSarahDias' provided by Alan Pereira in Jan 2017). Note the Sidmouth/Ximenes/Lousada link represented by Daniel Ximenes. For a period Isaac Aguilar #168 was a neighbour of Isaac Baruh Lousada #34 in Devonshire Square. Simon Greenfield's descent is compared with those of Julian Land and Alan Pereira here. Simon Greenfield notes that he found no link between his Aguilars and Diego Lopes Pereira aka Baron Moses d'Aguilar. The colours given to the Lousadas, Lamegos and Mendes da Costas are as used in other charts.